At Google I/O 2018, Google announced a featured named Continued Conversation that makes your Home speakers a lot more useful by continuing to listen after the initial command. That feature is now available—here’s how to check it out. 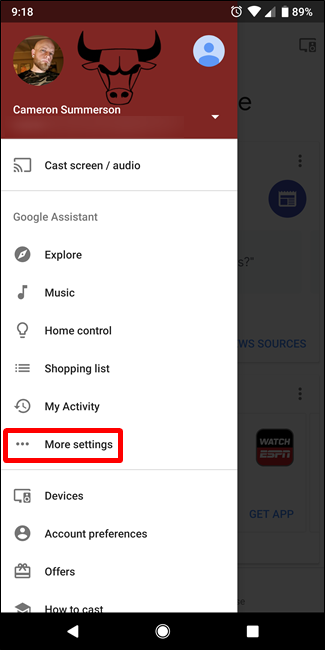 Update: Since the Google Home app redesign, this option has moved. You can now find it in the Home App > Account > Settings > Assistant > Continued Conversations. Currently, you have to say “OK Google” or “Hey Google” every time you want to give a command or ask a question to Google Home. But with Continued Conversation, Home will immediately start listening again after each command you give, making it easier to string together multiple commands or questions. For example, you could say “Hey Google, how tall is Jimmy Butler?” and Home will tell you he’s 6’8″. Then, immediately after, you can say “Who does he play for?” and Home will answer “Minnesota Timberwolves” without requiring a second “Hey Google” from you. 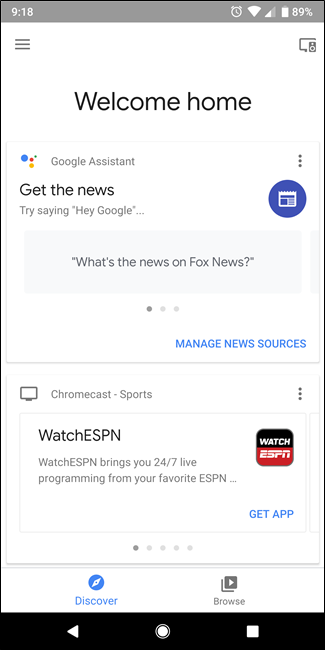 The feature is also smart—Google designed it to be able to tell the difference between new commands and casual conversation. 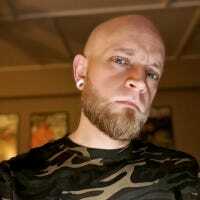 So you can say “OK Google, turn on the living room light” and continue a conversation you were having with friends before giving the command. Turning on Continued Conversation on Google Home is super simple. To get started, open the Home app for iOS or Android. Slide open the menu, and then tap the “More Settings” option. 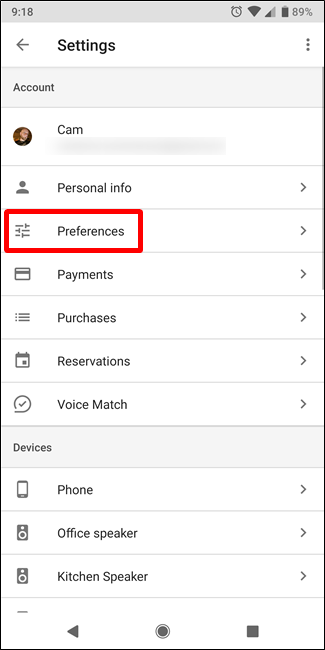 In the Settings menu, choose the “Preferences” setting. 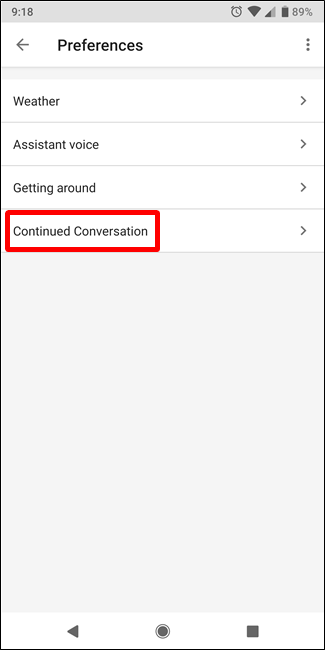 At the bottom of the Preferences page, click the “Continued Conversation” option, and then on the Continued Conversation page, slide the toggle to the on position. 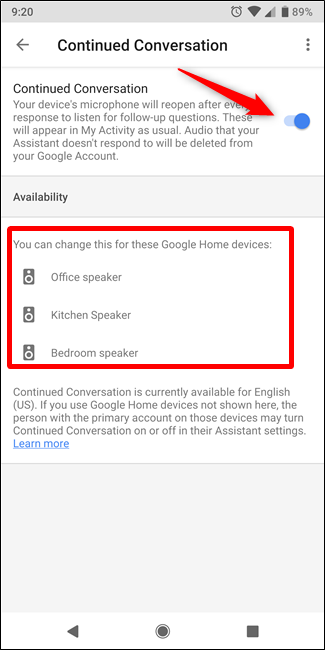 You’ll note that below the toggle it shows which of your devices support Continued Conversation—it’s only available on dedicated Home speakers right now.